This evening the wife and I ran some errands in the 82 300D, the last of which was a quick stop at the grocery store. When we returned to the car, it wouldn't start. The glow cycle (which wasn't really necessary since the car was still hot) went fine, but when I turned the key... no response from the starter. At first I thought it might be the neutral safety switch, but I tried again in Neutral and then Park... still nothing. Tried jumping the battery, but still got no response at all from the starter when turning the key. Any ideas? I asked the store manager if I could leave the car in the parking lot tonight, but I hate that it's sitting out there. IF you cant get any cranks I would put a voltmeter across the battery terminals and see what it reads. If that checks out check your fuses, relays and electricals to ignition system. Also check ground connections or anything not connected. X2 on this advice, i rigged up a switch so the i could use this to bump the engine. If this doenst work and you have a good battery and your engine ground isnt fried, try tapping the starter with a hammer. X3. This is a typical problem on these vehicles. I carry a piece of wire to jump those terminals when it happens. I just cross two screwdrivers, that saved me a few weeks ago when my ignition switch broke (the connection "key" between the main lock and the electrical portion broke). Guys, thanks so much for the quick replies. I just went back to the parking lot and tried the jump. Unfortunately, still nothing. It was too dark to thoroughly check the engine ground or tap on the starter, but I'll go back in the morning. I'll report back again tomorrow... thanks again. Yes, you did it correctly (that bypasses the ignition switch a neutral safety switch). If it didn't spin you may have a starter, wiring, or ground problem. When it's daylight, see if you are getting 12V to the starter and look for any loose electrical cannections. 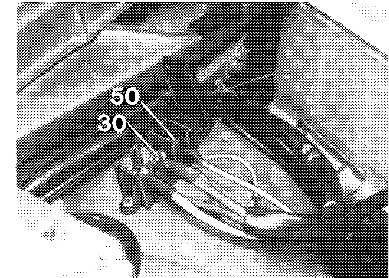 You can "test" the ground by running a jumper cable from the negative battery terminal to the engine block. If it's the starter itself, try tapping on it while someone tries to start it. before you touch the starter, remove the brown line going to the rear of the injection pump thats your fuel shut off actuator. Secondly if you have a volt ohms meter, check for voltage from the terminal on the battery to the large 17mm nut on the starter, if you do not have this then there is your problem. A 17mm wrench will fit between the nut and the starter signal flatheaded screw perfectly (the open end). Went back to the car this morning and, just for fun, turned the key as usual--started right up! Drove it home and re-started several times in the garage with no problem. I also realized that my terminal box on the right fender is installed backwards, so I was jumping the wrong wires last night. (I've decided to chalk this up to the late hour & darkness and not my pathetic inability to interpret a photo.) The jump worked just as described today when I hit the correct wire terminals. Other than checking all the electrical connections as described above, any other recommendations? Should I just drive the car as usual, or does this indicate I should consider replacing the starter or some other component? You should be jumping terminal one and three so even if installed backwards, you should have been jumping the right terminals. (I just looked closely at Craig's picture and it is NOT of the terminals that I have been jumping) Drive as usual. This problem is often dirty contacts in the ignition switch. Some people have installed a solenoid switch in the circuit to assure that full current is going to the starter. My 85 TD goes thru periods when it does this. Often it is in cold weather. Sometimes it will do it once and then stop. Sometimes it does it two or three times a day. But afterwards it will start for months on end with no problems whatsoever. This has been happening for about 5 years. That's why I carry the piece of wire to jump the terminals. I bought a replacement starter the first time it happened but I have never installed it. There is a thread on the forum which describes how to clean the contacts in the ignition switch. I'm not sure it matters which of the other two terminals you jump as long as you jump it to the separate one at the end. If it does it again, try the jumping with the correct terminals to eliminate the starter as the problem. My old jeep did this intermittently for months before it finally died completely so it could be diagnosed (bad neutral safety switch in that case). This time I was ready with a wire and knowledge of the proper terminals to jump after practicing in my garage following the previous episode. Unfortunately, the jump didn't work--I got (good) sparks at the terminals and what sounded like a click from the glow plug relay, but no response of any kind from the starter. What do you all think--time for a new starter? Give the starter a hard tap if it does not start. Then try it. Worn out brushes are a possibility. The car started right up this morning (no tapping on the starter required) so I just drove it to my indy and asked him to take a look. Should know more next week. Thanks, all, for the help so far!